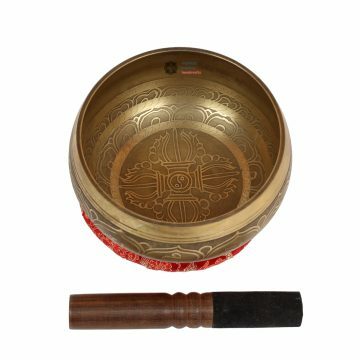 This Small Special Kasha Carving singing bowl is made of high quality 7 metals. There is figure of fish carving inside bowl which is symbol of peace. 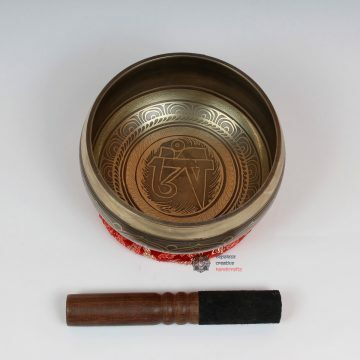 Outside, there are Om Mane Padme Hum chanting mantra on bowls with varieties of Style and on the base of bowls there is a nice craving of wheel regarding 8 direction. And inside wheel there is lotus flower which symbolizes beauty and spirituality in Buddhism. It has believed that lotus flower appeared at every place Lord Buddha placed his foot. Artist has work double carving work to make bowl more attractive and special. The singing bowl has pure singing sound too. This Singing bowl has mid deep singing sound.